It would be a great pity to have so many top a cappella groups, and industry movers-and-shakers in one place and not sit them down to discuss the state of the world. Fortunately this year just such a panel was organised. 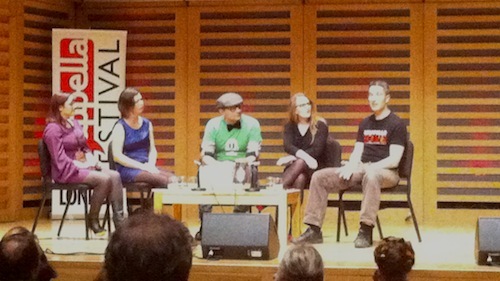 Led by Jes Sadler, the panel session had two halves. The first part was a discussion of the value of competition and collaboration in the world of a cappella music, and featured Clare Chen (Vocal Asia), Florian Städtler (VocalBlog), Bill Hare (legendary a cappella producer) and Belinda Magee (Sing A Cappella). Though the discussion was brief, there were some great points made. I particularly liked Bill Hare’s assertion that the vibe at a really good a cappella competition is much the same as a friendly a cappella festival. The talk around the unreality of reality TV and drama shows like Glee was also interesting. 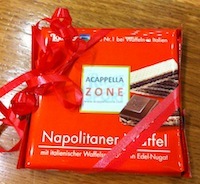 One funny but non-trivial issue raised by an audience question was whether the a cappella community is, in fact, too nice… It was suggested that some grittier collaborations, or simply less chirpy an attitude might help make a cappella music more accessible to those who write it off as superficial or cheesy. It seems like even the top groups show little sign of star swagger – with a notable tongue-in-cheek exception for FORK! Personally I think it would be a mistake to cast aside a wonderful community spirit and tradition of friendliness in an effort to win mass appeal for what is a fundamentally niche genre. It would be wonderful to increase the appeal of a cappella music, but the notion that more rivalry, drama or bickering within the community would help that in any way seems an odd one to me. As an embodiment of the spirit of collaboration, and example of the power of social media, the ad-hoc a cappella supergroup “The Single Singers” took to the stage for a surprise performance before the second half of the panel session, singing the upbeat groover “Shackles”. It was a great number, made all the more impressive for the fact that the singers assembled had never sung together before the previous day! This was one of many fantastic extra events organised for the festival this year. The group was formed shortly before the festival based on the observation (by Annemarie Homan) that often a singer attends a vocal festival and would love to perform – but isn’t currently part of a group, or isn’t accompanied by them. 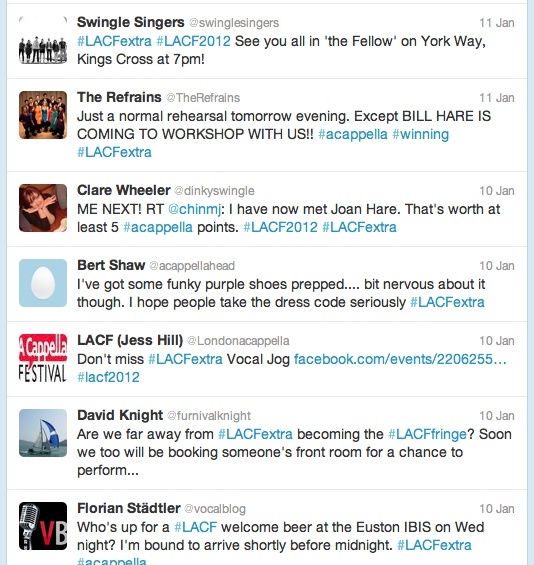 Using the power of social media the concept of a piecewise supergroup was made a reality, and The Single Singers made their debut at LACF2012. Each singer rehearsed the music at home before attending the festival, and then they had just one real rehearsal all together. You can find out more in this interview with Annemarie. Having whet our appetites for their main performance in the evening, the Single Singers departed, leaving the second panel to discuss the impact of social media on the global a cappella community. Florian was joined by Tine Fris (Postyr Project), Amanda Aldag (CASA) and Clare Wheeler (The Swingle Singers). It was a fairly interesting discussion. There was perhaps a little too much “intro to social media” and “social media howto” for me personally, but it did seem like the audience were quite keen to hear how to use social media for music industry promotion. I was quite surprised to hear Clare’s take on keeping your Twitter feed very subject-focused. While that is good advice for somebody using Twitter for promotion, I would have said her own feed was an excellent example of blending interesting professional insight with the day-to-day minutiae and fun observations that remind you you’re following a human and not a corporate robot. I would have been keen to hear her thoughts on maintaining this balance, rather than the more common advice to carefully self-censor. There was also some interesting discussion of whether social media has actually promoted a cappella (or just exposed existing fandom). Jes raised the issue of the large numbers of people who have left school or university and struggling to replace the a cappella groups they were a part of, and asked whether social media could be used to help these people connect and find new groups to sing with. Definitely a point to ponder further, especially in the context of LACF where the majority of groups performing used microphones, and a fair number had some form of audio effect applied. From the subtle reverb of The Swingle Singers, to the more extreme distortion and modulation effects used by Euphonism and FORK, one couldn’t help but be aware of the technology creeping into what is traditionally one of the most natural forms of music production. Fortunately no religious wars broke out in the audience on the subject, but I can see it being an increasingly hot topic of debate at a cappella competitions and festivals in future. So all in all, a very interesting and entertaining panel session covering some hot topics, expertly moderated, with some good audience input and a surprise musical interlude by a 20-strong a cappella supergroup. What more could you ask for?